At first glance, the Verbatim Portable Hard Drive appears bulky due to it being slightly larger than the competition, but it isn't heavier, and this extra size is due to the design, which cradles rather than wraps the drive inside, adding extra protection. This means it is in a better position to handle any shocks should you drop the drive. The silver casing is split by a single black band and includes a scratch-resistant coating, which gives the plastic a tactile feel. While the extra size adds to the overall bulk, you'll still be able to slip it into your carry case with little trouble. Connections are also impressive, as you'll find both USB 2.0 and FireWire 400 ports, so it can be used with either Windows or Apple laptops. Verbatim has also included cables for both ports which, considering this is one of the best-priced 500GB drives around, makes it a great package. Built-in drivers allow the disk to instantly install as soon as you plug the cable in. It's formatted for use with Apple Mac or Windows, so you'll be able to use it on either machine with ease. We found that when we connected it to our MacBook Pro, the drive was instantly recognised and forced Apple's Time Machine back-up software to ask if this was a primary back-up device. This means you'll be able to use it to back up the data from your Apple laptop hard drive whenever it's connected. For Windows users, Nero's BackItUp 2 Essentials software is included as a standard part of the Verbatim's setup. Verbatim doesn't make its own drives, so a Samsung disk has been used with a rotational speed of 5400rpm. It has the standard 8MB buffer and test speeds in daily use were more than acceptable. 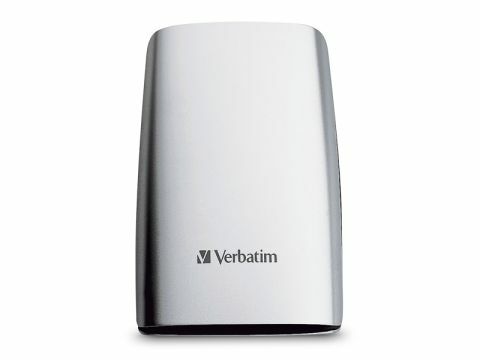 The Verbatim Portable Hard Drive is a fast and cost-effective solution. It may not be the smallest option on the market, but it proved to be one of the most effective and affordable units we've seen.